Had another up-early start yeserday, before the sun bothered to make an appearance, to ride over to Lee Quarry to have a go at the last in the series of xc races there. I’d had a go at the first in the 3 race series but had pulled out after my leg, which was still knackered from the Coast to Coast Race, gave up on me (I’d missed the second race as it clashed with the 3 peaks), so wanted to banish another “didn’t finish” demon. 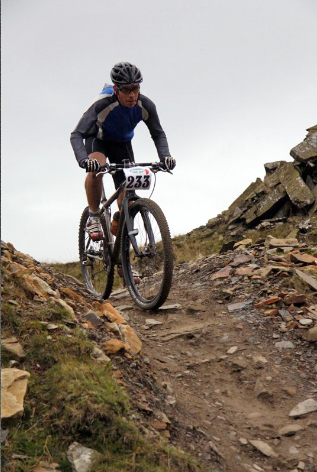 Finishing Relentless24 last week, albeit at a non-racing pace, felt good so I thought I’d get a shorter, fast race complete too. Just doing the 1.5(ish) hour race didn’t seem like enough training for the Strathpuffer and the final Daft Ride of the year though, so the alarm was set for just before 6am (uuugh, still don’t like early starts!) to give me enough time to get dressed, stumble round the house, eat something and shuffle out the door before riding a similar route to the one I’d used to get me over to the MTL challenge a few weeks back. It was chuffing freezing as I set off into the darkness, despite adding an extra jersey, skull cap and liner gloves I was shivering madly as I rode the first few, mostly downhill, miles from the house. My upper body was practically boiling in comparison to my feet however, which were crammed into a pair of race shoes that still hadn’t dried out from their last wash mid week the week before. Horrible over-cold foot pain stayed with me for most of the first hour before, mercifully, they slipped into numbness just as the sun started to pop it’s head over the tops of the hills. By the time I got to Lee quarry and found the signing on tent the temperature had failed to rise above “it’s not summer anymore” and my the numbness in my feet had spread halfway up my shins, which was annoying, but the ride over had been wonderfully quiet – I had the world to myself (save for a few torch carrying dog walkers up near Darwen tower) and the autumnal colours of the trees, lit up by thee early morning sun almost made the unappetising hour and lack of warmth worthwhile. I signed on, coughed up some cash and was delighted by one of the organisers letting me leave my camelback in the back of his car to make sure it was safe during the race – top stuff! Nervous pre-race toilet visit done I lined up at the bottom of the first climb, removed the last of my extra layers of clothing and, realising I had no-one to pass it to to look after, threw it over a fence, hoping it would still be there when I finished the race. The race came and went, I just sort of sat at a pace hard enough to make my legs and lungs hurt a bit, not wanting to go flat out and blow up when I had another ride home to come, but not wanting to waste the opportunity to hammer round the trails. The race seemed to setle down around me too – I dropped the people just behind me on the first lap and lost sight of most of the people in front of me within a couple of laps, with the bloke in front of me being an occasionally glimpsed blur of movement a few corners ahead, always travelling at the same speed as me. The marshalls were all cheery and a group of hecklers at the bottom of the main climb kept the atmosphere fun with some top notch shouting and advice (“just do a really fast lap, then you’ll win”) and I ground my way round until the ‘bell lap’ without incident, save my feet coming back to life about 2 laps in, in a pins-and-needly way. I did a bit more 2 wheeled drifting on the last lap, just for fun and gave it some effort on the last descent before remembering that, being evil swines, the organisers always have the finish at the top of the biggest climb on the course. Oh well. Head down for a bit longer and just grind it out until cheers and claps bring on the finish line seemed to be the order of the day – there was no-one behind me racing for whatever place it was I was in. Race over I stood around shivering at the finish line for a bit to clap home the other racers before rolling back down the hill, extricating the top I’d flung over the fence before the race from an annoyingly spikey bush and making my way down to the sign on tent to get my camelback back from the organiser’s car. The bike got lots of attention as the crowd grew for the prize giving and, warmed by the re-addition of several layers of clothing and a nice brew from the catering van, I answered as many questions about it as I knew the answers to while letting everyone poke and prod at it (I’m not sure what flicking a set of carbon forks can tell you about them, but feel free!). I hung around to watch the prize giving, thinking I’d come 4th in the race (and was happy enough with that), had a laugh at the utterly random (but totally wonderful) way in which the spot prizes were given out – fair play to the two lads who got prizes for flirting with the girls in the timing tent – and got the shock of my life when I was called out as 2nd place in the racer category. Thankfully I didn’t get a trophy for coming 2nd, as there was absolutely no room in my camelback for anything like that! Prizes all given out I headed of home the way I’d come, forgetting to remove the race number from the front of the bike, which turned out to be a blessing in disguise as pretty much every walker I saw on the way home moved quickly and courteously out of my way, presumably thinking I was doing some sort of race that they were getting in the way of…in fact it was so effective I might leave it on for the next few rides! And erm, that was that. All in I rode 93 miles, of which the race made up 21 and enjoyed another nice long Sunday ride, before demolishing vast amounts of food when I got home. Marvellous. That “putting a number on the front to stop people getting in the way” thing is good but is uselss on cars. Mine’s had a number on it for ages and I still have to tolerate people getting in the way.